Last week I had a cancelled appointment which meant I had a free day. This fit in perfectly with Lana so we could visit nearby shops similar to ours. Nearby for us means within 50km/30 miles. It also meant a good chance to test drive the new VW Bug. A local VW enthusiast heard we had a 1968 bug and volunteered to have a look at the engine. He came out and spent about 90 minutes fixing this, fiddling with that, and twisting the thingummy (aren't I technical) and the car was running so much better. A convertible Bug is really a Summer car. The day we drove was wet and cold, but this just added to the experience. I tried to take some nice photos from inside the car, but even with the camera's image stabilisation, the minimalist suspension meant shaky pictures. But I'm sure you can get the idea. 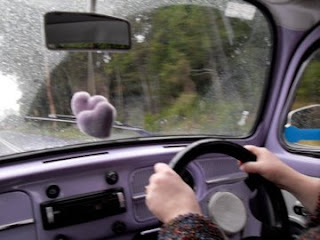 A car that has fluffy purple hearts has got to be "cool". Every time we went over more than usual bumpy roads and we bounced around, Lana just laughed. One of our locals owns a number of horses and was looking for someone to help care for them during the week. He came in on a recent weekend asking to put an advertisement on the notice board to ask for help. I quickly asked him how old he wanted this person to be and suggested Eric. 15 was quite OK, especially once he saw that Eric was quite a tall, physically capable lad and obviously responsible. Lana went there with Eric on the first visit to meet the owner and have a second ear to know the tasks required. So Eric now has a new job feeding the horses, ensuring they have enough water and occasionally meeting a vet or delivery vehicle. 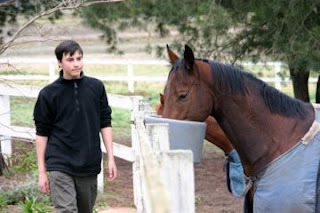 As part of the deal, the owner will also teach Eric lots of skills about horses and horsemanship. The horses are very impressive animals, bred for racing and they are all getting used to this new lad who feeds them every day. I popped out there earlier this week with Eric to see what he had to do and took a number of photos, including the one above. Eric is enjoying his new job, as well as his work with us at the shop, lawn maintenance and his homeschooling. It's raining again - which is always a joyous event in a place dependent on rainwater for all our water needs. 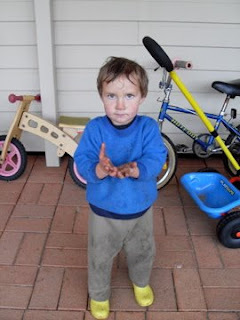 It is also joyous for little boys who love puddles and dirt and mud. Martin just came into my home office grunting in his communicative way and showing his hands covered in wet dirt. Eric looked at him and said, "I told you NOT to play in the rain." Lana and I both looked at Eric and started laughing. "As if THAT would work!" So Eric cheerfully cleaned up Martin's little face and hands and Martin rushed in to us showing his lovely clean hands before rushing back outside. I'm sure he'll return shortly, equally amazed that his hands somehow became dirty once again. There is a saying to describe a situation where someone is in a very desirous position: "Like a kid in a lolly shop." 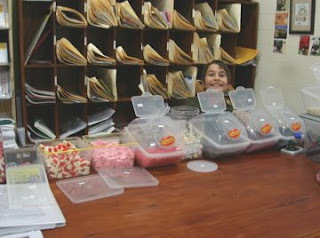 We provide a traditional service of bulk lollies served individually. Customers can select a bag of lollies by choosing exactly which lolly and how many they want. It is great seeing the children squat down and look at all the containers arrayed under the counter behind the glass, deciding which ones would be just right. "I'll have 2 Cobbers, 3 Bananas, 4 Milk Bottles, and ... how much is that so far?" "70 cents," I reply, looking at the change in the child's hand, "You have 30 cents left." "Hmm, OK, I'll have 3 Teeth." For those in more of a hurry we have pre packaged bags of lollies valued at $1 and $2. In this photo Peter is responsible for filling the lolly bags. He works at the shop for a few hours on the weekend. His duties involve serving at tables, cleaning up and providing general assistance as required. "If I drop one, can I have it?" asked Peter. We use tongs to select the lollies to ensure adequate health and safety and occasionally a lolly slip through. "So long as you don't drop too many," we advise, knowing that this can provide the wrong set of incentives. Yesterday was my day of shopping for the shop. This meant Eric and I leaving home at 5:30am and travelling 2 hours to the wholesaler in Sydney. We have been listening to a number of audiobooks together which makes the time rather enjoyable. After the wholesaler we stop in at the Serendipity ice cream warehouse and purchase very yummy gourmet ice cream for the shop. This time they packaged all the ice creams in a foam box with dry ice so they would survive the drive back home. 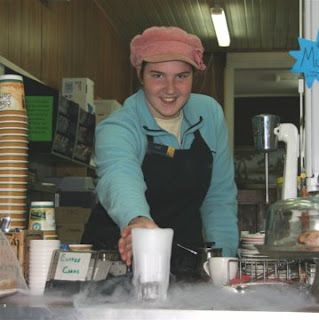 This worked very well and there was quite a bit of dry ice when we unpacked the ice creams back at the shop. Then I had the difficult task of keeping Eric and Ariel focussed on unpacking the groceries when all they wanted to do was play with the dry ice. This photo is of Ariel offering a new drink. I think customers will prefer coffee. It has been an interesting time building up the grocery section. I had some basics with which to begin and then whenever a customer asked if I had a certain product, my answer would be, "No, but I'll be getting it next week." And I did get it in next week. This has certainly built up customer loyalty, and helped to build up a comprehensive selection tailored for the village. Today I was able to get a part day off so I could spend some time with my parents who were visiting. They visit twice a year even though they live about 800 km (500 miles) away. The first day is always very tiring for them as the children rush to get in all their "Look at this Grandma" and "Grandpa, see this". By day 2 everyone is able to have a more enjoyable, relaxing visit with the older children playing games with Grandpa and Grandma being shown whatever is vital that she must see. My Mum is actually known as "Just Grandma". When Ariel was about 3 years old we were calling Lana's Mum Grandma A and mine Grandma B. Ariel was saying "Grandma B this" and "Grandma B that". My Mum helpfully suggested, "No, just Grandma is fine". So it has been Just Grandma ever since. Even the birthday cards are signed "Just Grandma and Grandpa"
Today it was raining which is great. Not flooding like it is up North, just good soaking rains that fill the water tanks and get deep into the soil. When it rained a bit harder, Martin pointed and grunted so I went outside with him. He was happy to just look, but I rolled up his sleeve and showed him how to "catch" the rain drops coming off the edges of the awning. That was fun. 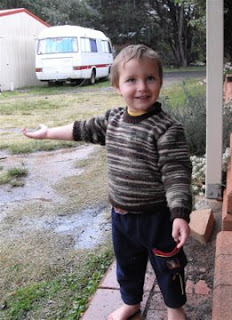 Then he noticed the puddle and that was even "funner" [as the little ones like to say]. There are time when being home doing "not much" are some of the best times. It has been 3 months since we last updated Bruggietales and many have wondered where we have gone. We have not gone anywhere and in fact are pretty much rooted to home base as we run our little Village Store. While I get to apply all my business experience and advice to a real business - putting my money where my mouth is - the children are also getting a practical real life training in business, customer relations, systems and a myriad other essential life skills. We live in a small village in country Australia and the shop we have just purchased is the only shop in town. The nearest shops are smaller ones about 15 minutes away in either direction, or larger ones 35 to 45 minutes away. So our shop is basically an "everything" shop. We are a licensed Post Office and newsagent, we have DVD movie rentals, lollies, chips, ice cream, stationery, greeting cards, groceries, milk and so on. Our coffee is top quality with all our staff Barista trained. Hot food and cafe service is also provided. The whole family is involved in different aspects, with me directing operations, Ariel managing during the week, Eric assisting with Mail and stock, James sorting mail and making home deliveries, Peter helping wait tables in the Cafe on weekends and Lana makes muffins and biscuits (cookies) as well as going to the bank and some local suppliers. The younger three will get involved when they get older. Here you can see Lana in the new car for the shop. Rather than drive to the local suppliers and bank in the 12 seater family bus which is a bit large for the task at hand, this little bug does the job much better. With magnets on the doors advertising the shop and the great lilac purple paintwork and fancy conversion Lana gets plenty of attention which suits our marketing plan very well. And Lana is able to drive the car she has always wanted to drive since she was 16! I'll try to post more. Do you ever get sick and tired of cleaning up the house? After all it will only get messy in minutes or hours anyway. Well, a new study reported in The Economist shows that disorder leads to more disorder and crime. AHI reports on the story and it is fascinating. When the researchers had graffiti on the nearby wall, petty crime and littering increased dramatically. I suspect this study can also be applied to homeschooling. Although you can be too over the top in having a spotless home, an organised home is much more efficient for work, study and play. At last you can find your things easier! We now have two kittens. The Ginger one is called "Coffee" and the patchy one is called "Tea". We had resisted any animals for a long time, but have finally succumbed. Before Christmas a dog - some type of Jack Russell cross - adopted us. His real owners had moved out of town and left him behind. They supposedly wanted the dog, but weeks went by with one failed attempt (the dog went walkabout the day they visited) and vague promises. Meanwhile we were visiting friends whose cat had just had kittens. One of the reasons we had avoided pets was because we had to worry about them whenever we went on a holiday. Our planned US trip has been cancelled because of the global economic challenges and changes to foreign exchange rates. And we have bought the shop, so our travelling will be reduced. James has wanted a pet for some time so I relented and we agreed to pick up the kitten in a few week's time when it was older. On a Monday evening I popped past our friends' home and picked up the kitten. The kitten got lost somewhere in the car on the way home but we found him in the back somewhere and all were excited at the new addition. The dog was VERY excited. So excited that on the Thursday Martin left the door slightly ajar, the dog rushed in and killed the kitten in seconds. Trauma, distress and sadness all round. The dog was promptly given to his owner's relatives who lived in the town. We then asked if there were other kittens around. Next day we received the two female kittens. The hardest part about the kittens? 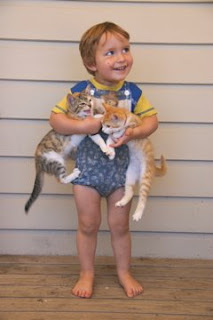 Training Martin to handle them with care. But I think this photo is showing how he is improving. At least he has them cleanly around their waists. Or that is where he began holding them but they have squirmed out of position. Many have asked us where have we been. It has been a month since our last post and we have a pretty good excuse. We have purchased a General Store and Post Office. That was our Christmas present! I have been very busy liaising with existing and new suppliers, ensuring existing and new staff will be properly trained, and lots of new plans are being worked out. The shop also has an active coffee shop. Our aim is to upgrade the presentation and quality and consistency of service and ingredients. We are using experienced Baristas (the fancy title for those that are experienced in making coffee) to train all our staff. I have learned lots about the art and science of making a quality cup of coffee! Lana and her mum have been making tablecloths for the coffee tables, I have been designing all the printed material and it is looking pretty good. The two photos here are some of the clever little cross stitch patterns Lana has been stitching. They will be placed appropriately around the shop to improve the country/homey feel of the place. 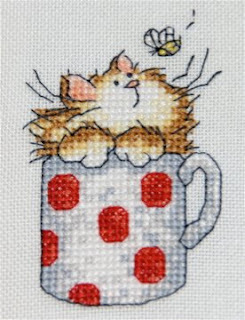 The pattern was part of the UK CrossStitcher Magazine Issue 198 (April 2008). Margaret Sherry is the clever designer and the set is called "Coffee and Cuddles". They are pretty cute pictures. 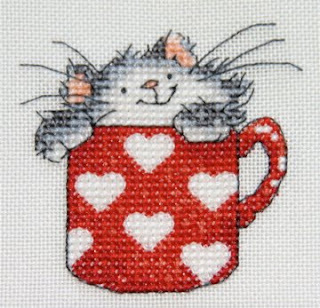 We will have more cross stitch pictures coming soon as Lana has now some new wall space to fill with her artwork!